MOSCOW, December 27. /TASS/. 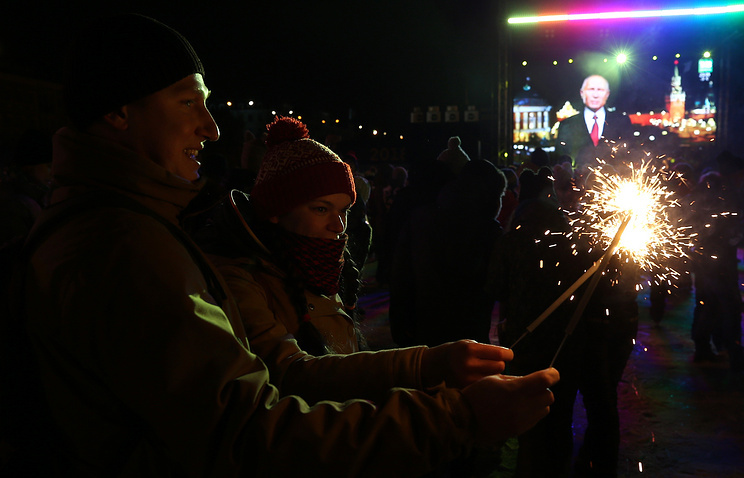 The traditional presidential New Year address, televised across Russia in the last minutes of the outgoing year, will be filmed in the traditional format and is unlikely to contain any surprises, Kremlin spokesman Dmitry Peskov told reporters on Thursday. When asked whether any surprises should be expected, Peskov replied: “No, it is going to be traditional.” “So far, we expect it to be a traditional address,” he added. Presidential addresses, aired on New Year’s eve, are traditionally recorded on the territory of the Kremlin or somewhere around. In 2000-2007, Putin’s speeches were made on the Kremlin’s Ivanovskaya Square, against the background of the Spasskaya Tower and the Kremlin Presidium. As those buildings were closed for reconstruction in 2008-2011, then President Dmitry Medvedev delivered his New Year addresses on the Patriarshy Bridge. On December 31, 2012, Putin made his address to the country’s citizens near the Kremlin’s Troitskaya Tower and the State Kremlin Palace. Putin’s New Year address delivered on December 31, 2014, was for the first time ever filmed on the premises of the Christ the Savior Cathedral, with the Kremlin seen in the background. In 2015-2017, presidential speeches were again filmed on the territory of the Moscow Kremlin. Year 2013 was a unique one, with two different presidential addresses aired in various areas of Russia. Far Eastern residents were shown the presidential address recorded several days before the New Year. The rest of Russia could see the video showing the president during his visit to the Far Eastern city of Khabarovsk, where he arrived on December 31 to support local residents affected by devastating floods. For the first time in 13 years, the congratulatory video was made indoors. Hey Buddy!, I found this information for you: "Kremlin spokesman expects no surprises in president’s New Year address". Here is the website link: https://russophile.org/kremlin-spokesman-expects-no-surprises-in-presidents-new-year-address/. Thank you.